A group of related bloggers who work in the general area of Golden Age Mysteries has decided to collaborate and publish a blog post every Tuesday as the Tuesday Night Bloggers. We began in the spirit of celebrating Agatha Christie’s 125th birthday anniversary. We’re now going to continue with a different Golden Age mystery writer; Tuesdays in November will be devoted to Ellery Queen. We welcome a new participant this week; Xavier Lechard is a well-known Golden Age blogger from France who brings us an international perspective. Curtis Evans and Jeffrey Marks have let me know they’re each taking a week off. I’ll continue to update this post if I receive notifications from any other interested party, including Helen Szamuely and anyone else who’s interested; just pass me a link in the comments below and welcome aboard. I can already see there is a wide range of interests focused through the lens of the Ellery Queen novels so this should be a fun month! 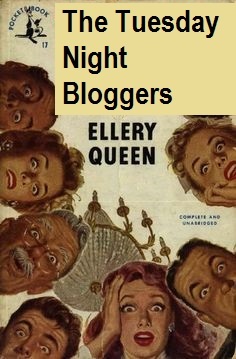 This entry was posted in Detective fiction, Genre fiction, Golden Age of Detective Fiction, Mystery, Novel, Tuesday Night Bloggers and tagged Ellery Queen. You’ve got a bad link there — the crossexaminingcrime one duplicates Clothes in Books. Thanks for this, though. Thanks! Must have been my mistake, I’ll get right on it.